Is Chocolate for Weight Loss Too Good to Be True? Mmmm chocolate, the ultimate indulgence. But could the sweet treat actually help with weight loss? People have been asking this question for years. Researchers have long known that cocoa is rich in flavanols, which have been shown to improve blood flow and lower blood pressure. But it wasn't until recently that scientists starting searching for evidence of chocolate as a weight-loss tool. A flavonol in cocoa called oligomeric PCs has been linked to weight loss, displaying anti-obesity properties. There may also be a correlation between eating dark chocolate and feelings of fullness. In one study, researchers observed that chocolate eaters had lower BMIs (body mass index) than non-chocolate eaters. 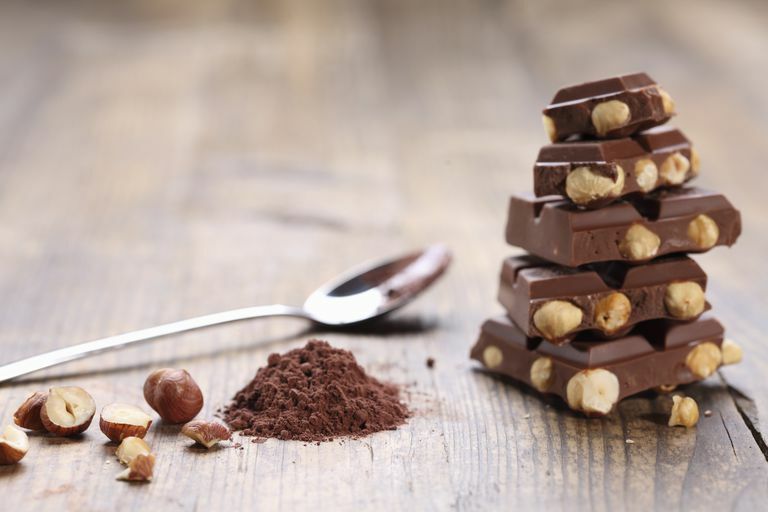 The study also found that chocolate eaters were less likely to suffer from a heart attack or stroke. While oligomeric PCs have been linked to weight loss, that's based on a study done on mice, the findings haven't been replicated in humans. As for dark chocolate increasing feelings of fullness, this applies only when compared to eating milk chocolate. It's not actually proven that eating chocolate causes lower BMIs, there is just a correlation and most study participants received relatively small pieces of chocolate, not an entire bar. As much as it pains me to say it, there's no direct evidence that eating chocolate will help you lose weight. And you certainly don't want to use the health benefits of flavanols as an excuse to take in loads of excess calories from the sweet treat. But that doesn't mean you can’t eat chocolate if you’re trying to lose weight. I'm a firm believer that you don't need to completely cut out the foods you crave to lose weight. In fact, eliminating your favorite foods altogether could lead you to give up on a diet. So, stick with cocoa-rich dark/semi-sweet chocolate for its health properties and filling factor. But be conscious of portion size and your total calorie intake. I love mini semi-sweet chocolate chips because they're so versatile, and a little goes a long way. Each tablespoon has about 70 calories, 4g fat, 9g carbs, and 8g sugars. Eat a small piece after dinner for some satisfying sweetness. Perfectly portion-controlled Hershey's Kisses are only around 25 calories each. Check out the Special Dark variety, too. Make hot cocoa. Dissolve 1 1/2 tbsp. unsweetened cocoa powder and 1 tsp. mini semi-sweet chocolate chips in 1/4 cup extra-hot water. Add 1/2 cup fat-free milk and another 1/4 cup water and microwave until hot. Stir in a no-calorie sweetener packet. Now you've got a 99-calorie cup of rich chocolate deliciousness. Toss some chocolate protein powder into a low-cal smoothie or shake. Even if chocolate doesn't help with weight loss, at least you're getting some protein. Use mini semi-sweet chocolate chips as an oatmeal add-in. They'll get all melty and amazing! Why Is Sleep Important for Weight Loss?